From left, clockwise: Ensenada fish tacos, potato crunchy tacos, and asada taqueria tacos from Hole Mole. Photo by Asia Morris. 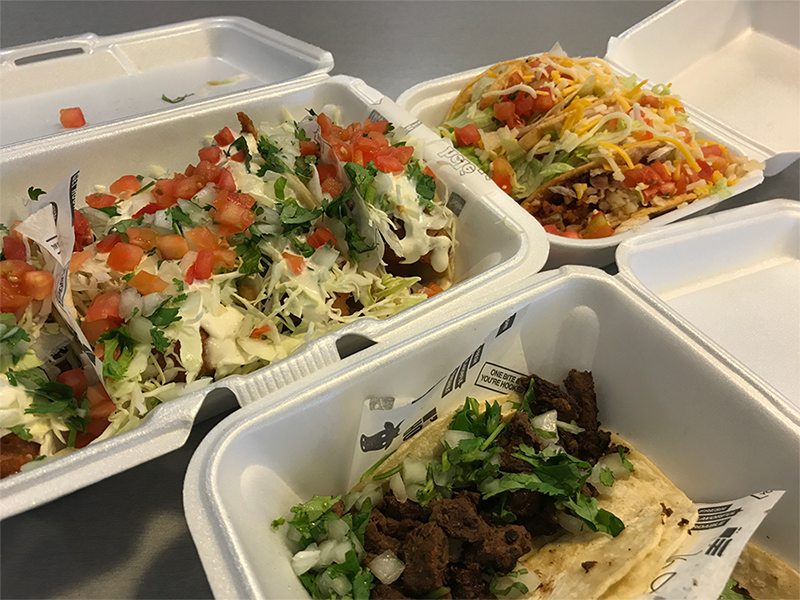 With Long Beach’s seemingly-endless supply of sit-down, walk-up, family-style, fast-food, chain or mom-and-pop Mexican joints, every day is Taco Day. While National Taco Day doesn’t fall on a Tuesday this year, it’s as good an excuse as any to go out and stuff our faces with some of our favorite local offerings. I prefer homemade, but if I had to choose, I’ve been going to Hole Mole a lot, specifically the Cal Heights and Alamitos Beach locations, since it’s conveniently spread out throughout the city. They have really good fish tacos. Also Hole Mole fish tacos, but if I’m feeling like something different, Seabirds’ vegan beer-battered avocado tacos (with extra Seabirds sauce) are the way to go. Baja Sonora hard shell shredded beef. They’ve never let me down, plus I like cheese on my tacos. Definitely Playa Amor’s soyrizo and potato tacos. They’re savory and filling, and they’re served with spicy aji amarillo which gives them a good kick. If you order them without queso, they’re vegan. Leo’s fish tacos are always delicious and taste super fresh, and for $1.50 on Taco Tuesday, you can’t beat the price. Super Mex carnitas tacos are always fresh and never greasy!